Makara Sankranti is the harvest festival, a new year and the festival of rejoicing and celebrations embracing the entire household friends and neighbors, the servants and the poor, the cows, and then all other living creatures symbolize universal love and kindness. The astronomical significance of the festival is that it marks the beginning of Uttarayana, the sun’s movement northward for a six-month period. Makar Sankranti refers to the event of the sun entering the zodiac sign of Makara (Capricorn). The Sanskrit term “Shankramana” means “to begin to move”. It usually falls on the 14th or 15th of January every year. The six-month period during which the sun travels northwards is highly favourable to them in their march towards the goal of life. The Devas and Rishis, Paramahamsa Sannyasins roam freely during this period, dispelling gloom from the hearts of all. It is said that soul departed during this period will reach Heaven or Vaikunta (Lord Vishnu’s abode). When the renowned Bhishma, the grandfather of the Pandavas, was fatally wounded during the war of the Mahabharata, he waited on his deathbed of nails for the onset of this season, at passed away on Vaikunta Ekadashi . This day marks the first day of the Shankranti festival and the last day of Margashirsha month. It is the time when all the old worn out, dirty unwanted things in the house are discarded. 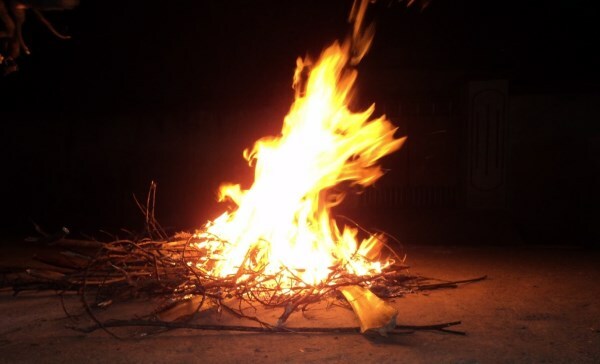 On this day, all the old wood and unwanted things are symbolically burnt as in a bonfire. Homes are cleaned and white-washed. The family members have an Abhynjana Snana (oil bath) at dawn and wear new clothes. They will decorate the front porches of the houses with beautiful and colourful Rangolis (decoration drawings made using rice flour/color powder on the floor). In the centre of the rangolis, the “Gugilu” a small dung balls, decorated with flowers are placed. The actual Shankranti day, people decorate their porches with Rangolis. They buy new vessel or pot and prepare Sweet Pongal , a special savoury made of rice, dal and jaggery. In Karnataka, a special snack called the “Shankranti Yellu” is made chunks of jaggery, roast besan dal, ground nuts, till seeds and copra. There are other varieties of food like chitra anna, payasa, vade, dishes made of avarekai, pumpkin and sweet potato etc made on this day. On this day in villages, people rejoice this festival with their new harvests like sugarcane, groundnut, paddy, turmeric, sweet potatoes, pumpkin, till seeds, and other food grains. They pile the food grains and offer puja to the Gods. In the evenings, young girls share the Yellu and sugarcane with their near and dear ones. This custom is called “Yellu Beeruva Habba”. The third day of Pongal is dedicated to cattle. People offer prayers to the bulls, cows and other farm animals as they not only are sacred but bulls help the farmers in ploughing and Cows give nourishing milk, cow dung is used as fuels in villages. On the thanksgiving festival for cows, the animals are decorated with colourfull paper, bells and strings, their horns and hoves are painted with bright colours. They are raced on fire in the olden days to mark the festival of Shankranti and Kany Habba. (This is avoided as cruelty to animals but scientifically, in olden days, this proved to be an effective way to keep the animals away from flies and insects). It is called the Maatu Pongal for Tamilians. On the fourth day people generally visit each other, go on picnics and spread festivities. This day is more celebrated among Tamilians and Telugu people. Sankrat – The people of Rajasthan celebrate the festival with local cuisine. Kite flying is an integral part of celebrations. Makara Sankranti – Maharashtrians celebrate the festival by exchanging halwas that colorful. Uttarayan – The people of Gujarat celebrates this festival with patang or flying kites. When we celebrate the Shankranti or Pongal in this manner, our sense of value changes. We begin to understand that our real wealth is the goodwill and friendship of our relatives, friends, neighbors and our environment. Our wealth is the land on which our food grows. We should have greater love and respect for them and for all living beings. Be charitable. Be generous. Spread Peace, Love and Harmony. This is the essence of Pongal or Shankranti festival.